What are some advantages and disadvantages of a cashmere hat when compared to hats made from regular wool. Softer – a cashmere hat feels very soft. Do you find that wool hats make you itch ? They make my head itch, that’s for sure. A cashmere hat won’t make your head itch. It’s funny how people find it hard to resist stroking cashmere. Lighter – a cashmere hat weighs less than a wool hat. I don’t think you really notice this unless you have a hat with a giant bobble on top, so it’s a small advantage. Although when packing for a flight when every gram counts, then a cashmere hat could make the difference. 4. Looks good – There is something about items knitted in cashmere which looks great. Due to the fibre being fine and the knit being small, it means that the final object has quite a smooth finish and a slight sheen. They don’t look unnaturally shiny like some fibres, they just have a lovely soft sheen which says quality. 6. Durable – A decent cashmere hat will last many hundreds of wearings. I always wear one of our reversible cashmere hats from September to March, and have had my current cashmere hat for about 4 years. That must add up to about 600 days of wearing it. It is still in very good condition. 7. Hard to lose – Maybe just because it is something that is a little more special than a regular hat. Also it looks unique. A cashmere hat from Mypashmina actually is unique to Mypashmina. Maybe we should try getting shops to stock them! 8.Easy to wash – You can just chuck your cashmere hat in the washing machine. MAKE SURE you use the wool or delicates cycle. They come out fresh and like new every time. Do not cook them at 60c and 40c is more likely to fail than succeed. Price – It costs a bit more than a wool hat. Having said that, I have seen plenty of wool hats for higher prices than our cashmere hats, so this is not really a disadvantage if you are buying from Mypashmina.co.uk. People might stroke your head – Yes, they really do. Jealously – people will envy your new cashmere hat. Credibility – We have been in business since 2002. We started with pashminas and added knitwear in about 2004. We still have some of our customers from the very first years buying now. I have seen 2 names I recognise from those early days in the week that I wrote this article. Quality – We regularly send our cashmere for testing at SGS labs. We find out the fibre length, width and whether any other fibres have been mixed. They never are. Unique designs – very few people will have the same hat as you. Free shipping and no hassle returns and everything you would expect in terms of service. What is a Garden Hammock ? Let’s define garden hammock to start with. GARDEN – a piece of ground adjoining a house, in which grass, flowers, and shrubs may be grown. Oh wow! Look how thorough we are being. There is no room for confusion here. Why Buy A Garden Hammock ? A hammock is a great place to relax. If you want to relax in your garden right now, what are you going to lay on ? A hammock is always going to be comfortable and ready. It would usually be placed in such a way that the sunlight is dappled through the leaves. A blanket on the ground will feel cold and damp after a while, and a lounger just is not as comfortable. A place for fun. It’s always fun to have more than one person in a hammock. Children really like it and the giggles can be heard from miles around! A proper hammock makes your garden look nice. Just take a look at our collection for the best looking hammocks available to buy today. If you are trying to sell a property, putting a hammock up in the garden makes it more appealing. A garden hammock could be the best investment you even made! A focus point – a hammock helps to define part of the garden for relaxing as opposed to cultivation etc. As a gift, especially as a house-warming gift. A hammock in the garden helps to make a house in to a home. How big is the space between the trees. Your new hammock should not be too long for the space, but it can be quite a lot shorter. It doesn’t have to be a perfect fit, the ropes will take care of that. 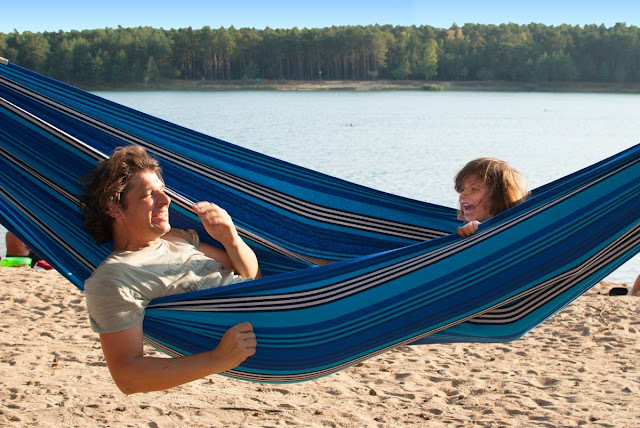 You can allow from 0cm to 300cm on each side of the hammock and it will work perfectly. If you have only one tree, or no trees then you will need to look at buying a hammock stand. You can always attach one end of the hammock to a tree and the other end to the house or veranda with a hammock hook. You should check that the hammock is washable. All hammocks are washable, but it is easier with a hammock that you can put in the washing machine compared to one that you would need to hand wash in a bath. For example a spreader bar hammock. If you only have one tree, or if your trees are arranged in such a way that the hammock would be hung across a thoroughfare, then it might be better to get a hanging chair or two. If you have a small garden, you will need to consider how much space the hammock takes up. Although it is hard to imagine a garden so small that the hammock won’t be an improvement. Many people use up there balconies with a hammock and just winch it up out of the way when they need the space for other activities. You don’t have to hang your garden hammock around the main trunk of a tree. If it is a good size tree you might have lots of suitable branches which will increase your options when it comes to finding the perfect angle. Think about where the sun will come from at different times of the day and when you are most likely to be relaxing in your hammock. In the hottest part of the day, you might want some leaves between you and the full glare of the sun, whereas in the evening when the sun is low, you might want to feel its full glow. Make sure any branches you select are strong and not rotten. They don’t have to be really thick. A healthy tree will have strong branches even if they are quite thin. Consider what you will be able to see from your hammock. It is better if you can see what you want from your relaxed position rather than having to move every time you want to see something. Use as a rain shelter. Just flip it upside down. This idea will work better with polyester or Sunbrella hammocks. The cotton hammocks will only stop the rain for a while. Store toys in it off of the ground. It is a quick way to tidy up the garden and stop the lawn getting yellow marks where toys have been abandoned for days. Collect fruit in it off the ground and away from the ants. Fill your hammock with apples, un-clip it, and two people can transport hundreds of apples in one heavy journey back to the house. Controlling smoke signals – joke! Don’t be afraid to adapt and upgrade your hammock. A cotton hammock is a piece of fabric after all, and it is easy to attach accessories such as pockets, buttons. You could add some strings and make it so you can tie it closed at the top. This works well with the biggest hammocks. Maybe you want pockets for drinks and books and everything else you need. How Can I Use A Garden Hammock In Other Places ? Well, obviously a hammock can be used anywhere it is hangable. I suppose the real question is whether you would want to. One of the good things about hammocks is that they are very portable. Especially the Hamaca hammocks which come with a matching shoulder bag. You can easily set your hammock up in the park. It makes the park feel more like your garden. When the weather changes you can move your hammock. First you can move it out of the garden and on to the terrace, then when that is no longer cosy, you can move it indoors. Setting up a hammock in doors is as easy as setting it up outdoors and it makes a great place to read a book. You could put a hammock in your workshop. Pretend that you are going to fix or make something, then have a quick nap in your hammock. 5 Reasons a Garden Hammock Makes A Great Gift ? Give it to someone who is moving house. You could even set it up in their garden ready for them. When moving house, the house usually starts off filled with boxes and disorganisation. Whereas the garden has nothing in it. Take a break from the unpacking and feel unburdened in your new hammock in the garden. It also makes a house feel a bit more like a home, in about 30 seconds. What is more romantic than relaxing together in a hammock. A hammock makes a lovely gift for a happy couple at any of life’s stages. A hammock will be a much appreciated gift for someone who is sick or recovering from an injury. If they need peace and rest a hammock in the garden will help that to happen. Children enjoy hammocks. A hammock is not only a very well appreciated gift, but it has a number of practical benefits. These range from encouraging reading (this is my own experience and assumption) , to having somewhere peaceful to relax. So, if you are a smart cookie, then get a bunch of hammocks for all those birthday parties your kids get invited to. Is A Garden Neccessary For A Hammock ? 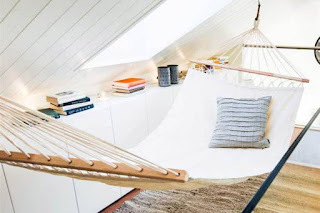 NO, you can have a hammock on a balcony, indoors, or in the yard, in the garage, in the workshop. You can pretty much put a hammock anywhere. You could hang it off the back of the car. If this guide was useful to you or you have anything to add, please contact us. We want to hear feedback on everything. 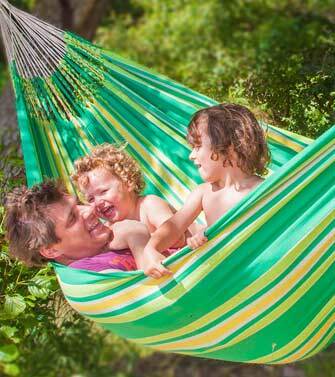 Hammock Heaven is part of Mypashmina Ltd and has been online since 2004. Would you like your children to read more? This is a common issue with most parents after the novelty of learning to read wears off young kids. The difficulty, after your children start elementary school, is many kids associate reading with school responsibilities. Young children often fail to realize that reading for fun also is possible. However, there are some action plans that can motivate your kids to read more. Creating a special place for your kids to read is a “winner.” Regardless of the number and ages of your children, they will love having a special place dedicated to them for reading. Whether you make their reading nook indoors or outdoors, they will use it. Equip your reading nook with a hanging chair or hammock for optimum results. Kids love hanging chairs and hammocks. Therefore, they will use their reading nook more than you think they will, simply because you installed a hanging seat or hammock. If your children are small and young, you could install a hanging chair or hammock designed for kids, with vibrant colors. As the kids grow, you can always upgrade to adult models in reading nooks. Why Hanging Chairs or Hammocks? Hanging chairs or hammocks are more fun than regular chairs or sofas. Kids love hanging chairs, particularly when they know these swing chairs are for them. Children like hammocks almost as much as hanging chairs. Even those post-toddler children, who vocally refuse to take a nap (“that’s for babies,” they often claim), often fall to sleep, like many adults, when they read (or look at the pictures) in a gently swaying hanging chair or hammock. Kids also enjoy playing, getting into and out of hanging chairs, running around, and swinging in hanging chairs and hammocks. When you install hanging chairs and Hammocks outdoors, they offer some interesting benefits, in addition to the advantages provided when they’re installed indoors. Sleeping in a hammock is becoming ever more popular. Many people are removing their beds in favor of a hammock. I did the same thing and I’m happy I did. Only campers and hippies formerly shouted from the rooftops, I had the “best sleep ever!” More and more non-campers and non-hippies are enthusiastically touting the benefits of hammock sleep. But, what does the scientific and medical community say about hammocks? Research, neglected for decades, has only recently been done to examine the truths about hammock sleeping. To date, scientific and medical research confirms what ancient societies already knew. Historians note that the first hammock probably was invented by the Greeks around 450 B.C., which is many, many years before Columbus sailed to the Bahamas. 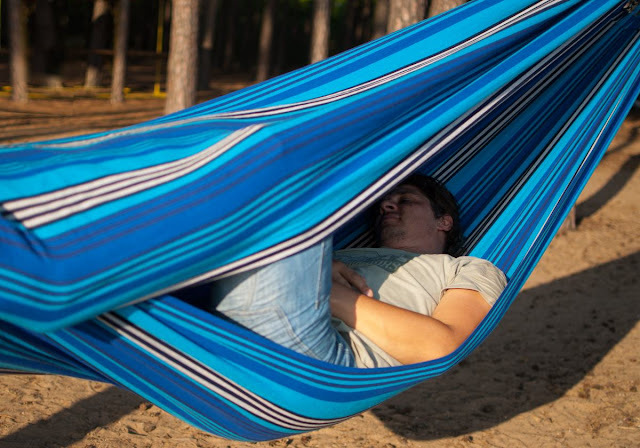 The legendary Maya people called their hammocks, “the gift of the Gods.” Most people, even scientists, previously assumed ancient civilizations chose hammocks because they were off the ground, away from dangerous spiders and snakes, or pesky stinging ants. These uneducated civilizations may have embraced other reasons, however. You’ll not need to contend with the dust mites common to mattresses. Hammocks may hurt your romantic life, as hammocks shine when you’re sleeping “solo.” Even if you and your partner are “cuddly” types, few people enjoy sleeping when “joined at the hip.” Even two person hammocks may push the envelope when your partner is a light sleeper. As you can see, the benefits of sleeping in a hammock seriously outweigh the one downside. Consider trying a hammock for a nap or for a night. A trial should convince you of the hammock-sleep benefits you get. If you believe your mattress caused you back pain, since hammocks often relieve back pain, what have you got to lose except your back pain? The measured increase in brain wave activity from a 2011 university study (University of Geneva in Switzerland), also improves your memory and learning ability. While there are scientific conclusions supporting the improved sleep quality you would receive from a hammock, there is only one way for you to prove it to yourself. Give hammocks a try and see what you’ve been missing. You may refuse to miss these benefits in the future. The garden is a popular setting to install your favorite hammock. You can install it anywhere you feel a sense of “peace” in your garden. However, here are some suggestions to fuel your ideas for ideal places for your hammock or hanging chair. Hammocks are favourite additions to your garden at home. Did you realise you can bring your hammock or hanging chair indoors, too? Many people love their hammocks so much they want to sleep in them instead of a bed. Setting up a hammock indoors is not difficult, so you’ll enjoy making this a do-it-yourself (DIY) project. While there are literally hundreds of websites with text and/or video to instruct you how to set up your hammock indoors, there are few sites with suggestions about “where” to hang your hammock. We’re going to solve that curious problem momentarily. Stay with us. This issue stumps even those who love relaxing outdoors in their treasured hammocks. Don’t worry. It’s easier than you first think. Your bedroomIf you love taking relaxing, rewarding naps in your outdoor hammock, you’ll probably get the best sleep of your life when you desert the traditional bed and sleep in a comfy hammock. Your living or family roomYour living room, great room, or family room is another ideal place to hang your hammock. If you don’t have a DVR, you better get one, as you’ll find yourself nodding off during movies and games in your always comfortable hammock. Should you think a hanging chair is a better idea to keep you awake till the end of the movie or live game you’re watching, you’re probably wrong. It’s just as easy to find “nap time” in a hanging chair as a hammock. A sunroom or “9-month” roomA sunroom, particularly a so-called 9-month room with heat for those cool spring and fall days and nights, is an equally perfect place for your favorite hammock. While a warm, sunny spring or summer day is ideal when you have an outdoor hammock or hanging chair, installing a hammock in a sunroom, even when it’s raining outside allows you to enjoy your hammock even in inclement weather. A finished basementWhen you’ve finished your basement as a game room, TV room, or “man cave,” you have a perfect place to hang a hammock indoors. Since the anchors in the walls are unobtrusive, you won’t have a problem if your finished basement has a lower than average ceiling (under 7 feet) or has a “drop” ceiling (not strong enough to hold your weight in a hammock or hanging chair). If you love relaxing in your outdoor hammock in the yard, you’ll equally love hanging a hammock indoors in one of these places. You also may have other rooms, e.g., a home office, which might be your personal preference for installing an indoor hammock or hanging chair to be available in all types of weather. When you’re not using your hammock, you can easily store it in small spaces. Since your wall anchors are harmless, they pose little danger to anyone. If you’re concerned with their presence when your hammock is stored, you can easily cover them with a wall hanging or a plant hanging on the exposed anchor. As long as you carefully install your anchors into wall studs, they will be secure and support your hammock (with you in it) for long periods, e.g., naps or overnight sleeping. Regardless of the size of your home, you can install a relaxing hammock in almost any room except a bathroom or kitchen. When you’re taking a shower, or making gourmet dishes, you probably won’t want to relax in your indoor hammock or hanging chair. Travel hammocks are increasingly popular as alternatives to tents, when you go camping, hiking, and/or travelling almost anywhere. Travelling is exciting, but, sometimes, it can become annoying, particularly when you need to navigate airport security. Yet, camping and hiking are popular, healthy alternatives. Better than most tents, even upscale ones, travel hammocks make traveling easier and more pleasant. There are multiple good reasons why. Whether you’re traveling by car, or using public transportation, e.g., trains, travel hammocks provide distinct advantages for you. When you’re going on long hikes or camping, these advantages will be graphically evident. Travel hammocks are versatile, offering you the pick of locations where you’d like to sleep. You can sleep wherever you’d like. Pick your location and you can set it up. Travel hammocks are easy to install if there are some trees around.Just install your travel hammock, which is fast and simple, where you want it. It should only take a few minutes. Travel hammocks are lightweight and ideal when packing space is at a premium (almost always). These hammocks pack small and light. You can literally take them anywhere you want to go. Safely sleep in the great outdoors, since you’re off the ground.Unlike even the best tents, you’ll sleep safely and won’t need to contend with night-hunting ground insects and arachnids (spiders). In summer, you’ll love the cooling air circulation a travel hammock provides. During fall, you can line your travel hammock with a sleeping bag or insulated blanket to keep you warm and toasty.Hammocks promote air circulation around your body, without the confinement of a tent. Even on the cool nights of fall, you can place a sleeping bag in your travel hammock to keep you warm and comfy, instead of trying to sleep on the hard ground. These are but a sampling of the many benefits travel hammocks offer you. If you like to travel and camp out in the outdoors and you love your hammock at home, you should have a travel hammock to make traveling easier – and lighter. Hammocks can make awesome addition to any outdoor spot or even your backyard. With a lot of amazing styles accessible easily in the market today, you can easily hang them anywhere. You don't need trees to support them and they can coordinate the whole look of a house amazingly from rustic to unimaginably modern. Hammocks are used by a lot of people in many outdoor places. They give a calm look to the whole place without occupying any greater amount of space. There are a lot of reason due to which the hammocks in any outdoor place such as garden or backyards can make everyone spend more time outdoor. Keep reading the articles to know those interesting reasons.